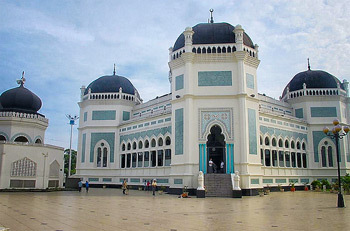 The dome of Al Ma’sum Mosque that had flat and quadrangle shape also in the peak of the roof has the usual crescent moon decoration was also found in other Islamic buildings like the Mosque and the tower that according to the experts often were connected as the symbol of peacefulness, where Islam was broadcasted without violence. Apart from the plan, dome, curves (arcade), the crescent moon decoration on its peak, the influence of Islamic art is clearly visible in its ornamentation, whether on the wall, the ceiling, the poles, and the curved surface (face Arcade) that was rich in the decoration of flowers and winding plants painted with oil paint. This floristic decoration apart from being styled reminds to Tumpal and mekara motive, also painted with Naturalistic style. Except the floral motive and geometric motive, the combination between Polygonal, Octagonal and circle decorations was also appealing. The motive of this kind especially very much found in walls, the curved surface, the ceiling etc. This motive was also found in the iron curtain form of the quadrangle windows and the shape of the curve that reminded us to motive the Indian style wall carving. In Indonesia, this kind of decoration was often acknowledged as Terawangan or Kerawangan decoration, apart as being a decoration, this decoration also functioned as ventilation.